Elementals are ruled over by the angels, archangels, and the deva spirits. These spirits are thought to possess supernatural powers and are usually invisible to humans, except for those who possess the psychic ability of clairvoyance. They are the spirits of the four elements air, fire, water, and earth. In my experience, elemental and nature spirits are more than merely a belief system. They are actual beings, like we are, but different and with more supernatural powers. Like us, they may be loving and kind, benevolent, mean and cranky, peaceful, playful, or destructive. They do cause things to happen. They are mainly visible to us only with the senses, but many people are consciously unaware of them. We may see a fairy among the house plants, or feel a sudden sense of warmth, when a fire spirit is near. The air elementals may cast a sudden breeze, and we are seeing the magic of a water elemental when we see rainbows or a shape in the clouds. They appear among us wherever they are needed, or where they are comfortable. Often, I see them where nature is untouched or in well-tended gardens, ponds, parks, and houseplants. Sometimes I find a fairy near sick plants, telling the plants how to move its leaves to gather more sunlight. Recently, more often than usual, I have felt the desire to ask others to connect with nature. It does not mean we should live in the wild unprotected by the trappings of modern conveniences, although of course that would be optimal for connecting with nature and practicing basic survival skills. But at the very least we should be connecting with nature in our everyday lives, so we can do what is needed to assist the elemental and nature spirits in tending the plants, air, and waters. We can for example, harness fire energy positively by allowing the sun to become energy for us with solar power. 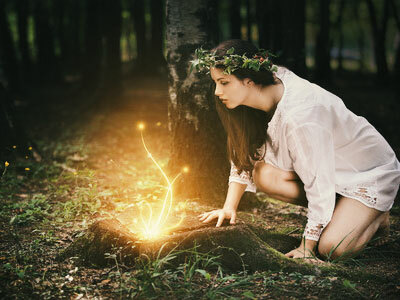 Lightworkers can help the elementals by tending to and healing nature around them. We can become more aware of nature around us, by training ourselves to notice the living things around us, and feeling their existence, their life force. We may notice a day when the sunlight or moonlight appears to be more sparkly than usual, or notice a patch of garden that seems very alive and active. We should notice the clouds, mists, the birds, everything. Starting today, why not make an effort to notice the life forces in nature. We can begin to walk more softly, to be more careful. Becoming aware of nature around us can help us to heal ourselves, by healing and practicing less harm on the elements and living things around us. A single mom, fashion designer, fitness trainer, and a natural born Intuitive, Leila lives a full and rewarding life in Texas. Her psychic practice includes a growing clientele that includes several famous celebrities. She's mastered many metaphysical tools, including: Tarot, Runes and Astrology, and has been using her natural Clairvoyant, Clairaudient and Clairsentient gifts for more than thirty years, gifts that go back at least three generations. She can easily tune-in to a client's energy, addressing their most urgent issues and needs. She's always been a strong advocate for women, helping her clients to feel good about themselves, on the inside as well as the outside. Not only is Leila still very active in the Goddess community, but she's a gifted mystic who can communicate with loved ones, interpret your dreams, perform guided meditations and accurately communicate your astrological path. If you'd like clear insights on your past, present and future that will help you embrace your most confident self, you can find Leila at PsychicAccess.com.